Above and on the front door of the Children’s House, you will find a number (619-665-1264) to call when you arrive to pick up your children. Please call the number and the Teachers will bring your child out you your car. Thank You! 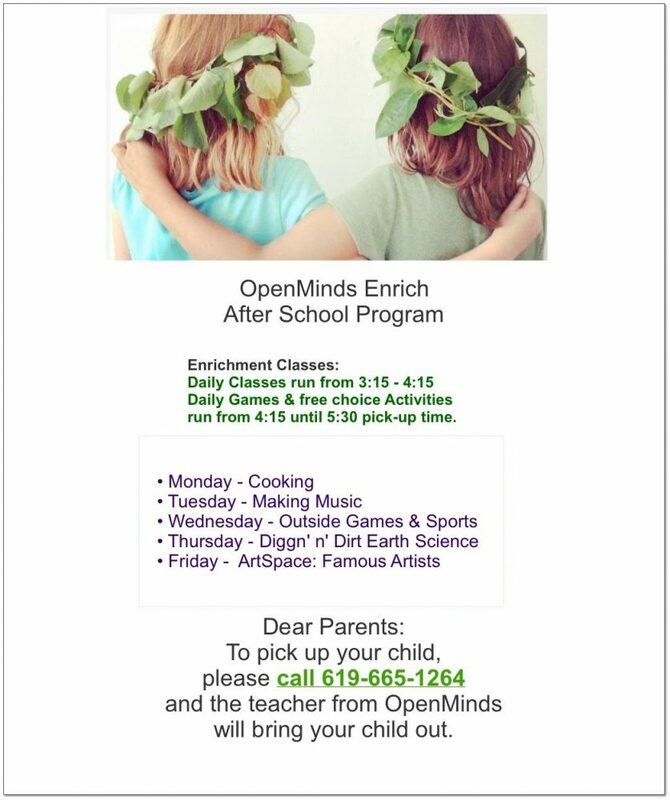 The OpenMinds Enrichment after school Program started last week. Every day is a different theme and we will be starting today with our Making Music Class. Remember you may sign your child up for all five days or sign up for certain days depending on your child’s interest. Please visit our website to learn more about how to enroll for monthly or hourly options, complete the medical release forms, and about our pick-up process. Parents who are already enrolled will be receiving more information on logistics later this week. Please let me know what questions you have and we’ll get you answers. We are looking forward to meeting and working with your children! The school will also be offering Hebrew language classes with Ilana Czastokowski after school on the Beth El campus on Tuesdays and Thursdays from 3:00-4:00. You will enroll directly with her for this class and you can reach her at ilanacz@hotmail.com or 619-925-2704. Get in touch with us if you need any additional help with your Hebrew enrollment.